Everything I am wearing in today's post is something I have owned for quite awhile except for the necklace and tote. Even though I have added several new items to my fall and winter wardrobe, I enjoy going back to my favorite, tired and true pieces and styling them new ways. Since I began my blogging journey, I have become more conscious about what I buy and make sure that the majority of things that come home with me can be worn more than once or twice. Having this mentality has helped broaden my closet options as well as save money. Plus, it's almost like a personal challenge...how can I wear (insert item) in a different way and create an entirely new, fresh look. Usually all it takes is a few accessories like a piece of jewelry, bag or pair of shoes to breathe new life into something old. I personal news, this weekend was JUST what I needed. Friday night I took my girls out on a date to Cracker Barrel (fancy, I know) and then to the dollar movie (again super fancy) to see Dolphin Tale 2. It was soooooo good and I may have cried at the end. Then we snuggled up in my bed and had a slumber party while Ross was out of town. Saturday our friends hosted a "football & friends" get together. These girls, their husbands and kids are our extended family. Kids and babies were everywhere - crying, peeing in corners (no joke), grabbing stuff they shouldn't be grabbing, crying, drooling, spitting up, playing in a bouncy house during the rain, making messes, crying, hitting each other over the head, tattle telling, crying, laughing, playing, giggling, crying some more and having the time of their lives. And guess what? So were we. My oh my, times have changed. Our Saturday nights aren't like they used to be, but a chaotic peace set over me. At one point, I looked around the house, witnessed some of my best friends' kids bonding with my own and couldn't help but smile regardless of the ruckus. Isn't it funny how sometimes all the crazy noise that surrounds us ends up giving us the most serenity and security? I hope everyone has a great week! Stay warm with this whole Arctic Blast thing that is going on...holy, freezing! Sounds like a great weekend. And I love your outfit! Happy to hear you had a fun weekend, love the layered jacket! Your layering is so, so cute here! Happy to hear you had a great weekend! Sounds like such a great weekend! I love remixing my wardrobe too and using those favourite basics like this. 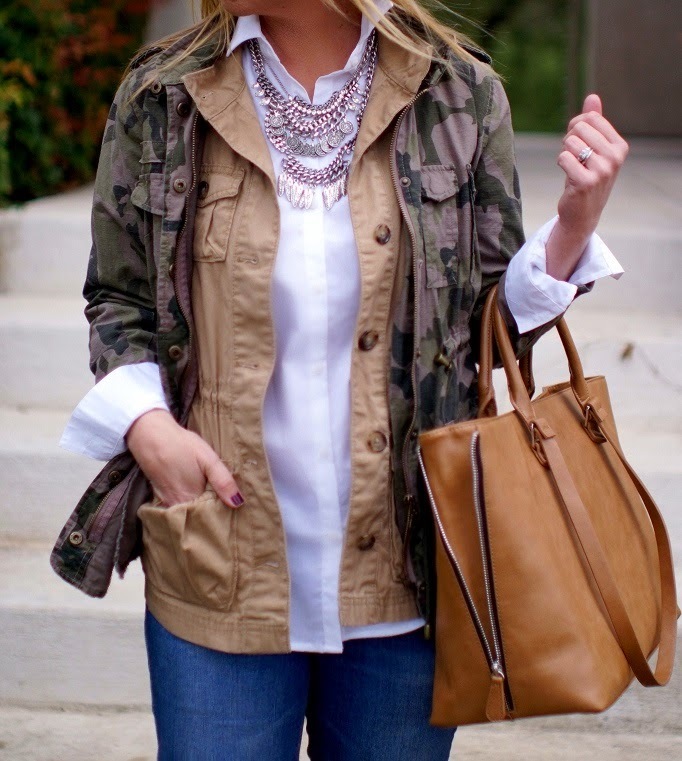 Love how you layered this look and that necklace is beautiful! Adore both the necklace and tote!!! Again, in disbelief they are from F21 - you find such great items there! I totally think that getting new shoes or a new necklace opens up so many styling ideas. Such an easy way to expand your wardrobe! Glad you had a good weekend -- nothing wrong with a cheap dinner and movie date. We have a tradition of Redbox and Chinese take out, haha! Love the jacket over vest layering, such a cute way to layer up for these chillier days. this is what i LOVE about your style- you're always changing it up! to me, this looks like a completely different outfit! Love that you restyled all these pieces! I love the layering and your shoes! I spent the entire weekend at home cleaning and doing laundry. It's not my favorite, but it was much needed. Ditto on the post about the weather being weird in Texas! Same here in Houston! What I love is that I never completely put away the summer wardrobe, I usually can incorporate the shirts with my blazers, sweaters, vests etc. But yeah, I was still expecting the temps to be mild here at this time. But never fear, I am sure that in a couple of weeks it will be in the 70's again! What a chic way to layer your jackets! Love this whole look! Love the camo jacket! Nice to see you using yoor old favs to create fun, new outfit! I have some pieces in my closet that I have since forever and still find a way to mix and match with new ones! Hope you are having a wonderful day! 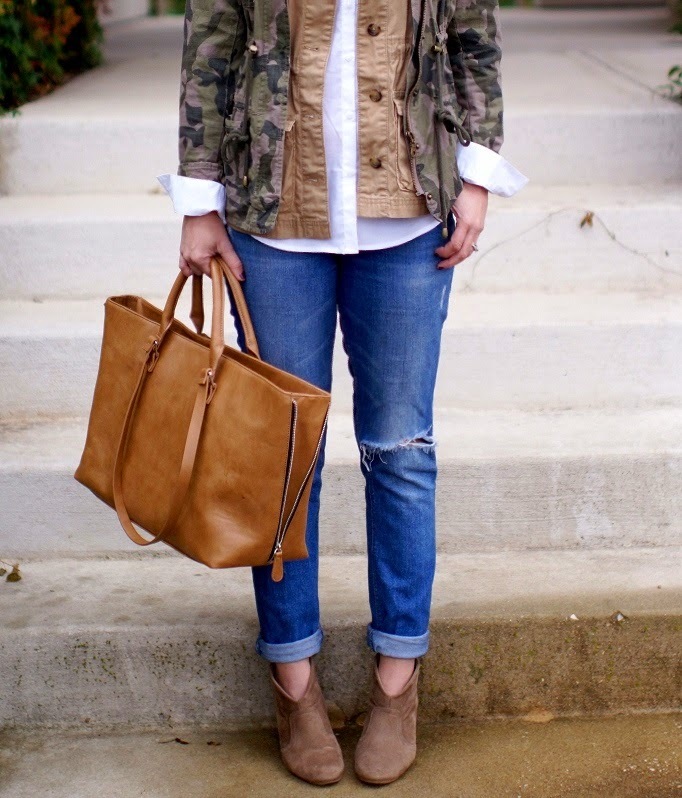 I love how you layered the jackets, it is so nice shopping in our own closets! Love the colors and you always create such inspirational outfits. Figuring out new ways to way something is the best! I definitely need to try layering a vest under a jacket! You described serenity within chaos so perfectly. I've felt the exact same way. 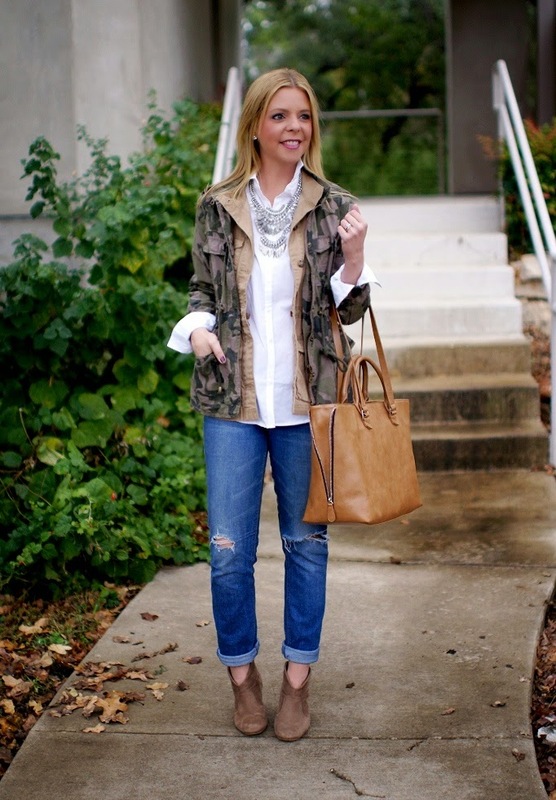 And Shanna, you have been mastering layering lately! 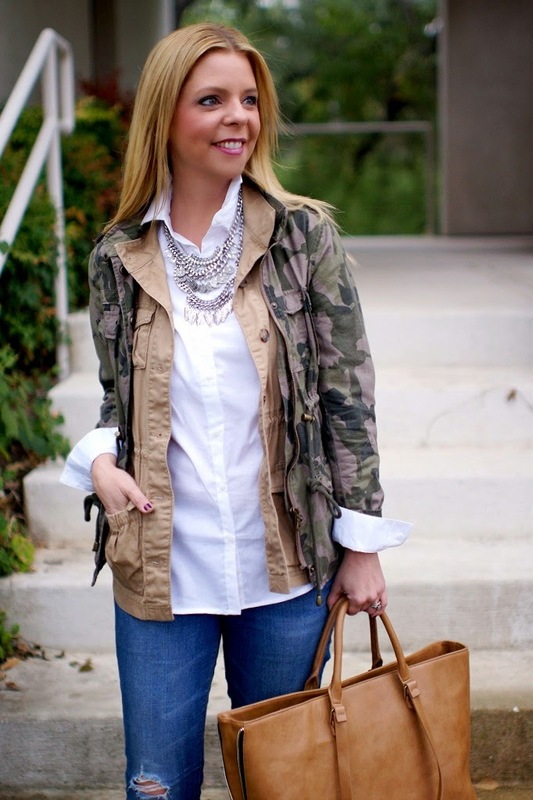 Another perfect look - & I love how your jacket is camo instead of the standard army green utility jacket everyone (including me) has on - adds just a bit of pizzazz! I love all the layers going on in this outfit! That's one way to stay warm :) It's been freezing here too and I am not a fan and not ready for winter, though it seems to be upon us! Sounds like you had a fun weekend with your girls! Hope you have a great week!! I'm all about reworking your wardrobe and I'm loving this combo! I'm glad you had a great weekend with your girls. Stay sweet girl! Sounded like a crazy but "hella" of a good weekend. You look amazing and in love with look. I need to look in my closet and see what I have to recreate this look. Thanks again for the inspiration. I feel you! I have 18 nieces and nephews. Our family gatherings are nuts just like your gathering with friends. I am actually the only one of my friends to have school age children, since I was a teen mom (18 years old). They all waited and are having babies now, so now they know what I went through in college, trying to work, having a baby and a toddler, and studying for school. I didn't "go out" till I was 24. I get the weekends out now since my kid's paternal Grandma has no other grandkids, they spend weekends there and I have them free. I usually read though. Awwww, sounds like you had THE BEST weekend ever. And hooray for remixing what's already in your closet! I've been trying to do a little more of that myself. No more buying things because it will look good on the blog!!! Love you! 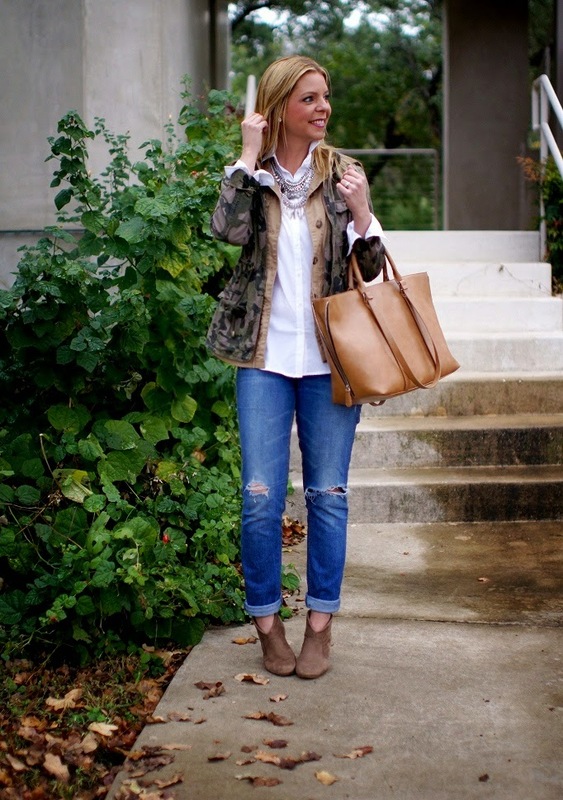 I love the fall look to this outfit -- and that bag is awesome!! why are you so cute?! I love the old to new... this outfit is on point!! 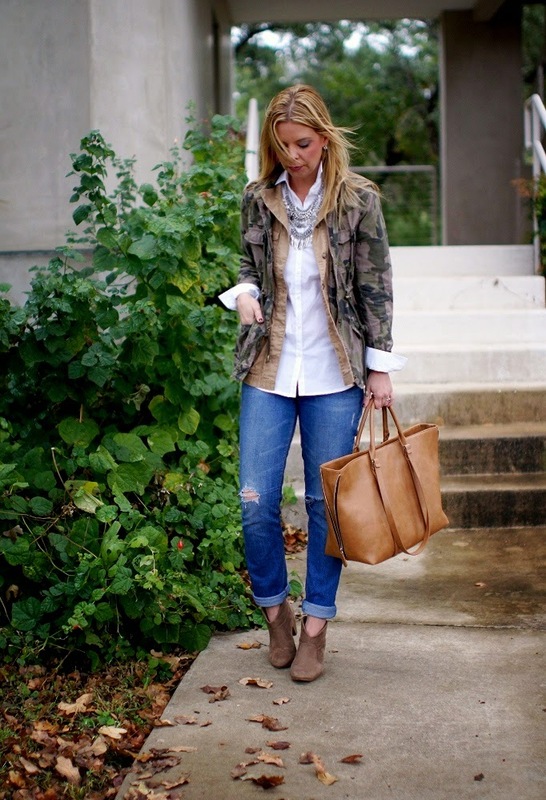 Love this layered utility look with the classic white button down! It's the perfect mix! I have really been trying to focus on mixing up my current items this month as well. This layering is excellent!